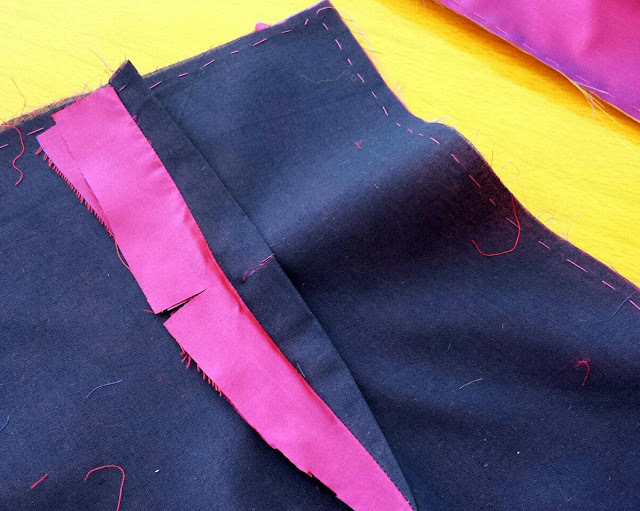 Last week I told you all about the Tailored Jacket class I attended recently at Alison Smith's School of Sewing. 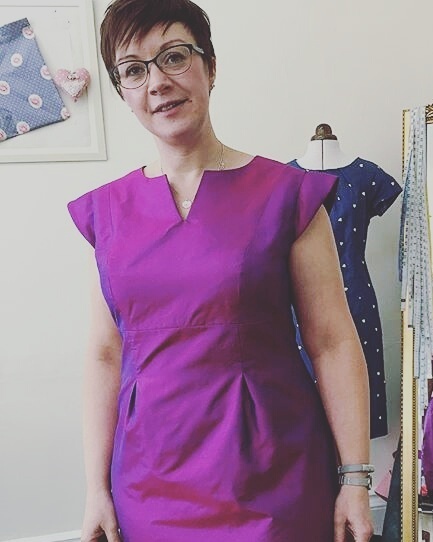 Today I'm going to share my experience of the Couture Dress class I went on a couple of weeks later. 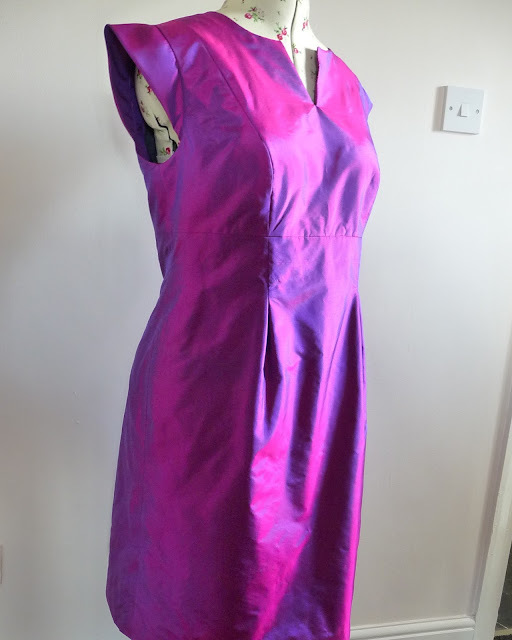 I decided to make Simplicity 2404, a pattern that I've had for ages but never got round to making. I think it might be out of print now, as I couldn't find it in Simplicity's online catalogue. I added cap sleeves, or "flanges" as the pattern calls them from Simplicity 1156. 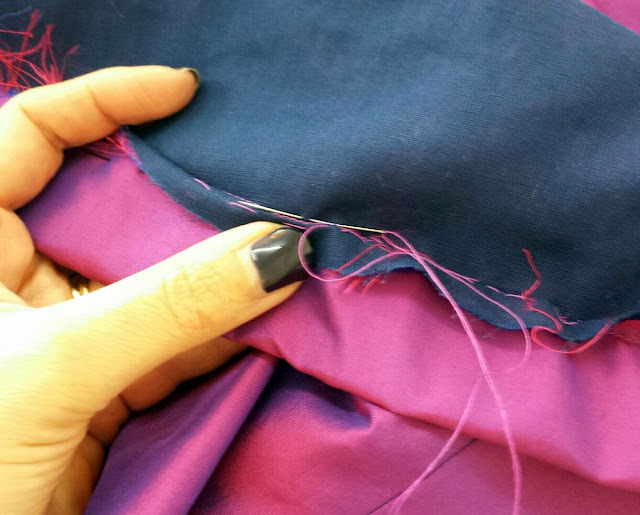 The class teaches you couture techniques, including hand finishing, and you are encouraged to use "special" fabrics. You don't have to of course, but I changed my original plan of using a navy broderie angliase underlined with a coloured lining, to using this gorgeous shot silk taffeta. I'd originally bought the taffeta to go under the broderie angliase. 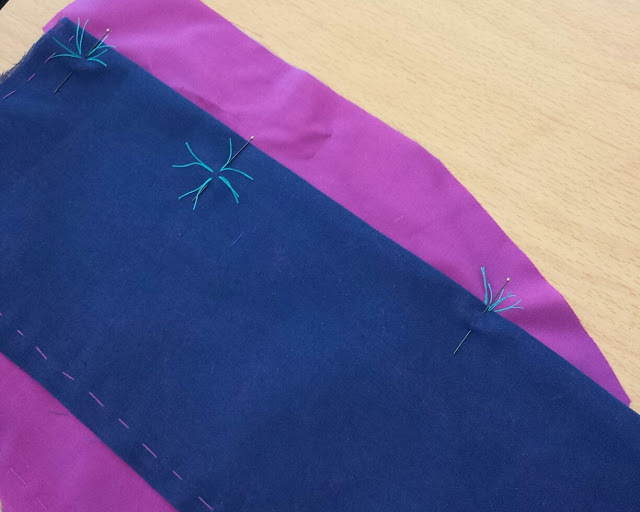 As before, we spent a long time cutting out our fabric and preparing the pieces. My bodice is underlined with silk taffeta and the skirt with cotton voile. The underlining is hand basted to the fashion fabric within the seam allowances. Hand basting the underlining in place. I then learned to make balanced darts in the skirt pieces. I think they're my new favourite thing! Darts marked with tailors tacks - I learned to do these properly too! 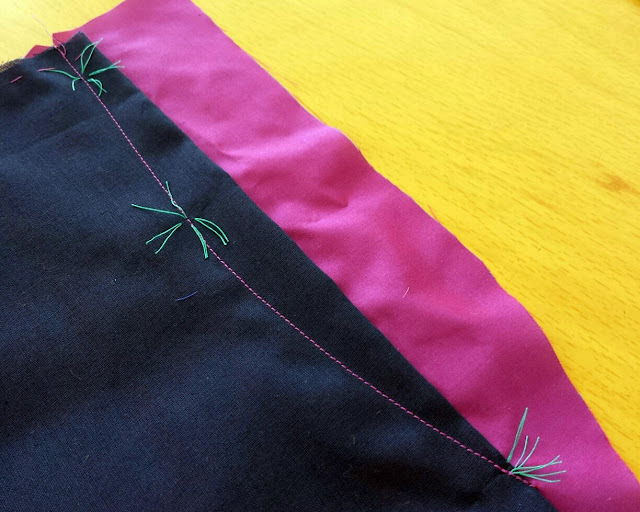 Step one of a balanced dart - apply a folded strip of fashion fabric behind the dart position. Completed balanced dart with "balance" fabric pressed the opposite way to the dart and clipped open to lie flat. 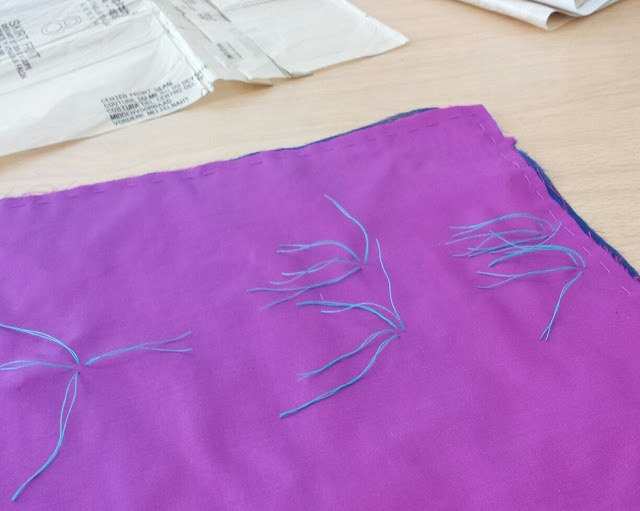 There was lots of hand sewing, which was actually very relaxing. The opening for the concealed zip was stabilised with strips of silk organza which are hand applied. Hand applied silk organza to zip opening. The hem of the dress was hand sewn, taking tiny stitches into just the cotton voile underlining so that nothing shows from the outside. 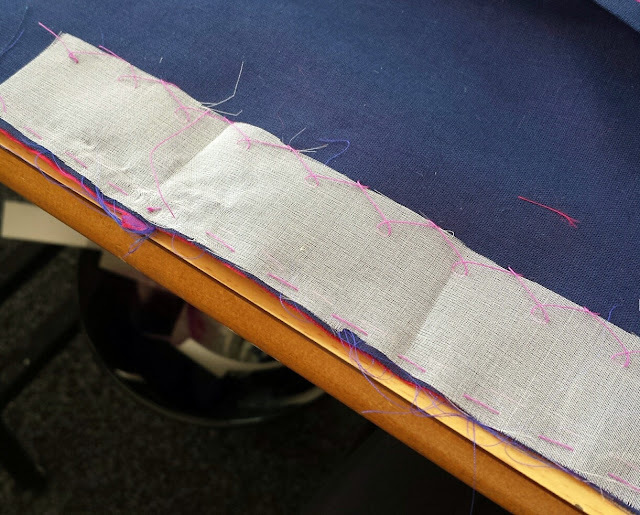 Invisibly hand stitching the hem. 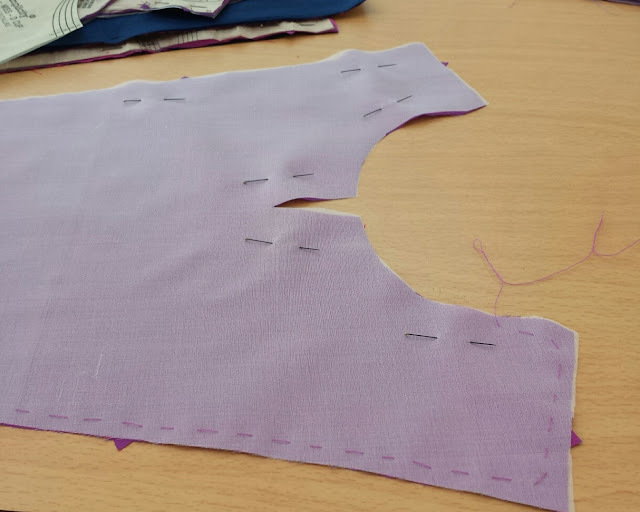 The lining was then hand sewn down to the turned up hem of the fashion fabric, so that everything was completely enclosed and no raw edges or seams are on display. 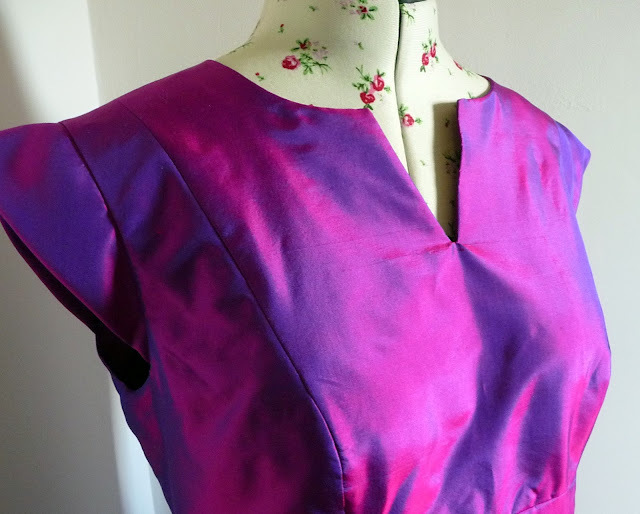 In progress shot - although it looks finished, I still had the hems to do at this stage. I haven't had a chance to wear the finished dress yet - I'm waiting for an invitation to somewhere special - but it feels fabulous on. The silk is so lightweight even with the underlining and the dress feels so comfortable. I can't wait to wear it! I'll have to get my husband to take me out for a fancy meal somewhere, or cocktails! Simplicity 2404 bodice close up. As before I totally loved learning from Alison. I've already put some of the skills I learned on both classes into practice as I'm making an outfit for a friend to wear to Ascot. I'm also hoping to go back to the School of Sewing for another class later in the year. I have to say, I'm totally hooked on doing things properly now! It's gorgeous Sam and the fabric & colour look so good on you. The finished product is really gorgeous, Sam. The colour of the fabric really pops. Lovely!! 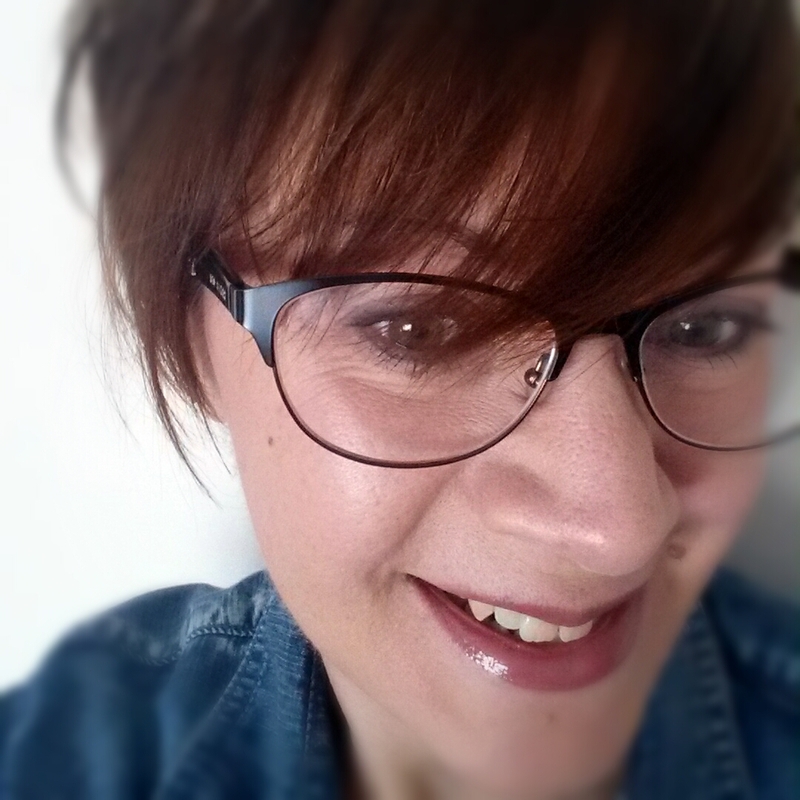 I was especially interested in this post because I've just finished watching Alison's Craftsy class on couture dressmaking! I also thought the balanced darts were brilliant! Her classes are my all-time favorites on Craftsy, and I really envy you getting to take lessons from her! wow, that fabric is stunning, I'm glad that it's taking center stage in this beautiful dress, it looks so good on you! For sure, you'll have to go somewhere special, and wear it. It's stunning. Find somewhere nice just to wear this dress. It's so lovely. The color is just beautiful! Very well done!